Galaxy mid-size chassis (7-1/4"W x 9"D x 2-3/16"H) deluxe AM/USB/LSB CB radio. Features a Blue Starlite back-lit face plate, Blue 5 digit frequency counter, Blue 2 digit channel display, adjustable Talk-back with on/off, large S/RF meter, RX/TX LED indicator, dimmer control, clarifier control, RF Gain, Mic Gain, NB & ANL filters, auto SWR circuit, High SWR LED indicator, rear PA & external speaker jack & 4 pin front mount microphone. Two year factory warranty. Made in Vietnam. 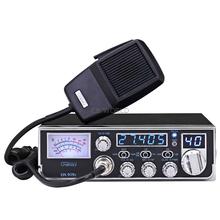 This is a great radio, right out of the box!!! Much better performance than my Cobra 29 LTD Classic, which has been peaked and tuned. CB World has great customer service, and super fast shipping! Months of research YouTubes and finally decided to try this radio. Very pleased to talk 10 miles and hit them with an S9. Barefoot too. Would eventually like to have it peaked but I didnt trust anyone. CB world has great reviews on trustpilot so just get it!